Currently the Linx ExcelRead/ExelWrite functions can slow down performance when reading/writing large volumes of data from/to an Excel spreadsheet. To improve performance of these reads/writes it is suggested that you make use of the Linx Database plugins (specifically ExecuteSQL) to achieve this goal. This driver allows for SQL to create a connection to an Excel spreadsheet. HDR : It represents Header of the fields in the excel table. Default is YES. If you don’t have fieldnames in the header of your worksheet, you can specify HDR=NO which will take the columns of the tables that it finds as f1,f2 etc. MaxScanRows : Excel does not provide the detailed schema definition of the tables it finds. It need to scan the rows before deciding the data types of the fields. MaxScanRows specifies the number of cells to be scanned before deciding the data type of the column. By default the value of this is 8. You can specify any value from 1 – 16 for 1 to 16 rows. You can also make the value to 0 so that it searches all existing rows before deciding the data type. For example: Provider="Microsoft.ACE.OLEDB.12.0";Data Source="#FilePath" ; Extended Properties="Excel 12.0;HDR=NO;IMEX=3;MAXSCANROWS=10000;READONLY=FALSE"
=$.Settings.ExcelConn.Replace("#FilePath",$.Settings.FilePath ) or something similar. Apend the existing LINX Settings in the demo to match your environment, i.e. SQL Connection, file paths etc. And, text after ‘$’ sin specifies the range of data to be read. Thus, as per the above command string, it will read the data from the excel cell A1 till E5. In other words, it will read 5 rows from row# ‘1’ to ‘5’ and 5 columns from column# ‘A’ to ‘E’. This will remove the contents of the selected cells, unfortunately you cannot remove entire rows or cells but merely clear them. Updates can be used like normal, to change values or to clear certain contents that meet the criteria. You are able to add WHERE clauses by references the columns and the criteria to meet. The create statement on Excel file is used to define the range of the workbook that you will be using. This method creates a SQL ‘table’ of sorts in the sheet. The DROP TABLE command will remove all the data in the sheet, unfortunately you are not able to remove/delete the sheet itself. The one limitation of this method is that a .xlsx file will need to exists first before any command can be execute. Unfortunately, you will not be able to use these command on an Excel spreadsheet if it was created or written by the Linx ExcelWrite function. To get around this issue, and to avoid manually creating an Excel file, you can create a “template.xlsx” file stored in a file location that won’t change, this will just be a blank Excel spreadsheet. 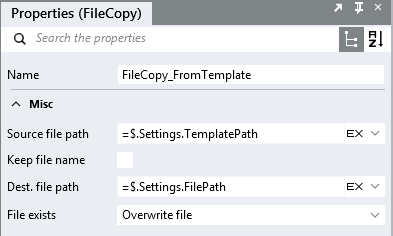 You can then make use of the Linx FileCopy function which can copy the “template.xlsx” into your “live” location with a new file name for example “FundTrades_20190101.xlsx”. The way in which SQL communicates with Excel, the Excel spreadsheet that you are working with needs to have its "columns" created in order to perform SQL actions (inserts, updates, selects). Now that the ‘table’/sheet is created, you have a data range to work with. Now to insert some data into the worksheet. You can pass in dynamic variables or outputs in the normal way by dragging the desired variable into the insert. To insert large volumes of data into the Excel spreadsheet, you can make use of the Linx BeginTransaction function to significantly improve the writing times compared to the ExcelWrite function. Note: In the demo process there is a loop, this is just to simulate large amounts of data being outputted. 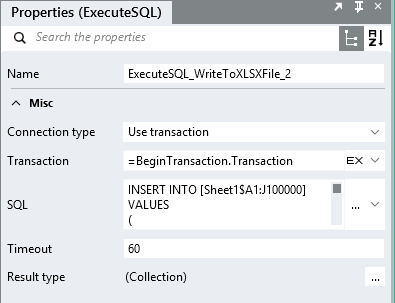 Connection string: Use the same connection string as the previous ExecuteSQL function. The above should set you up with all the operations you need to interact with a Excel file through the LINX Database components. Take a look at the demo for a more thorough understanding.